Learn more about drummer Hal Smith's On the Levee Jazz Band, which features trombonist Clint Baker and New Orleans' finest jazz musicians. On The Levee Jazz Band made its debut at Phineas Fogg’s in Pensacola on Nov. 13, 2017 – playing for a large and enthusiastic audience of listeners as well as dancers. In 2018, the band performed at the Bombay Club and the Old U.S. Mint in New Orleans and will be featured at the New Orleans French Quarter Festival as well as the San Diego Jazz Fest. On The Levee Jazz Band also recorded a compact disc in January, 2018. The well-blended front line of Baker, Polcer and Goldberg backed by the New Orleans swing of Smith, Tokarski, Gouzy and Belhaj produces a sound that pays homage to the Kid Ory tradition, but with fresh ideas from the individual musicians. The band delights in playing danceable music from a traditional repertoire that includes stomps, rags, marches, blues and vintage popular songs. A full-time musician since 1978, Hal has played in nearly every Classic jazz band of note: the Dukes of Dixieland, Jim Cullum Jazz Band, Butch Thompson Trio, New Black Eagles, Fat Babies, Banu Gibson and led bands such as the Roadrunners, with Bobby Gordon and Rebecca Kilgore. 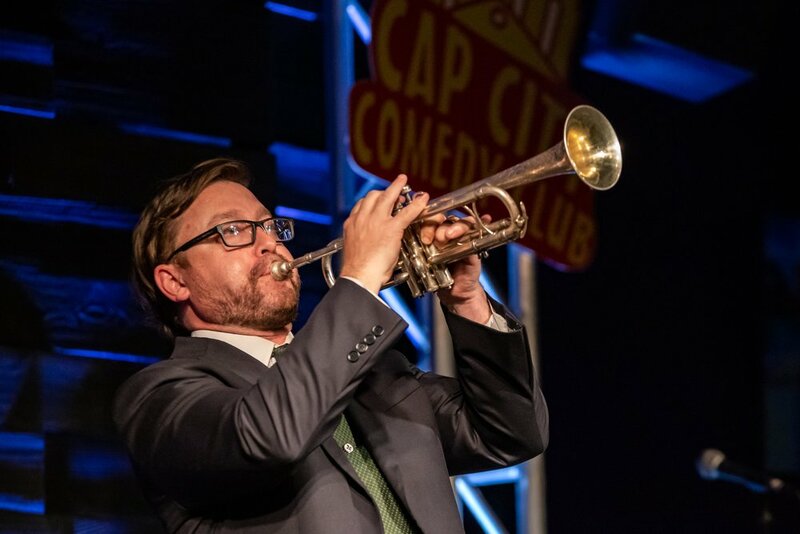 Hal travels across the U.S. to work with bands including his own “Swing Central” and “Pretty Wild.” In addition to his musical activities, Hal writes for America’s Finest City Dixieland Jazz Society’s JAZZ RAMBLER. He is a longtime fan of Kid Ory’s drummer Minor Hall. A lifetime student of New Orleans Jazz, Clint has mastered all the instruments that are commonly found in a traditional jazz band. He has performed around the world on cornet, trombone, clarinet, banjo, guitar, bass, tuba and drums. His resumé includes appearances with the New Orleans Rascals (Osaka, Japan); Jim Cullum Jazz Band, Barbara Dane, and his own group, Clint Baker’s New Orleans Jazz Band. Currently he tours with the Grand Dominion Jazz Band and the Yerba Buena Stompers and maintains a busy schedule as bandleader, sideman and teacher. Ben Polcer grew up at listening to jazz greats at his father’s famous New York music club, The Eddie Condon Jazz Club. After finishing his music degree at Michigan, he performed a variety of genres in New York before moving to New Orleans to play the early jazz music he loves in its birthplace. He has toured with the Loose Marbles, Meschiya Lake and has led bands at swing dance events across the U.S. Currently he leads the New Orleans Six. Ben brings to every performance his passion for the collective ensemble style that makes the New Orleans jazz sound so distinct. Joe is an accomplished all-around reedman. He admires the classic sounds of Omer Simeon, Johnny Dodds and Sidney Bechet as well as modern Jazzmen. In addition to clarinet, he plays saxophone and flute and has performed Swing, Blues and Funk music. Joe has played a wide variety of Jazz styles with Jason Marsalis and with Marcus Roberts’ Modern Jazz Generation. He can also be heard at a number of venues in and around New Orleans with the Smoking Time Jazz Club and several other modern and Traditional groups. Kris is a graduate of the Berklee School of Music. He also studied with legendary Bebop pianist Barry Harris and holds a Master’s Degree in Music from the University of New Orleans. Since relocating to New Orleans in 2011 Kris has become one of the busiest pianists in the city, performing at the Bombay Club, NOSH, Allways Lounge, Steamboat Natchez and Kingfish among others. His favorite pianists run the gamut from Jelly Roll Morton to Bud Powell, and he is especially fond of the keyboard style of Kid Ory’s pianist Don Ewell. Alex is an accomplished guitarist who he led his own Crescent City Quartet in addition to playing folk music, and with Blues and Klezmer groups. He also played with the James Dapogny Quartet and the Cakewalkin’ Jass Band before moving to New Orleans. In the Crescent City he works frequently with Tim Laughlin, Duke Heitger, the Riverside Jazz Collective, and the Messy Cookers Jazz Band, to name a few. Alex is an outstanding interpreter of vintage Jazz guitar stylists like Johnny St. Cyr and Kid Ory’s longtime sideman Bud Scott. Loyola University and his Master's in Music from the University of New Orleans. He is the proprietor of Magnolia Entertainment and a member of nine New Orleans bands including the Jumbo Shrimp Jazz Band, Aurora Nealand & the Royal Roses, Miss Sophie Lee, The Fritzel’s All-Stars, and his own classic R&B band, the Catahoulas. Joshua also performed with and managed the New Orleans Jazz Vipers for over seven years.